Denmark’s Queen Margrethe II showed off her powerful voice on Tuesday as the Danish royal family took to the castle balcony to perform a special chant for her birthday. 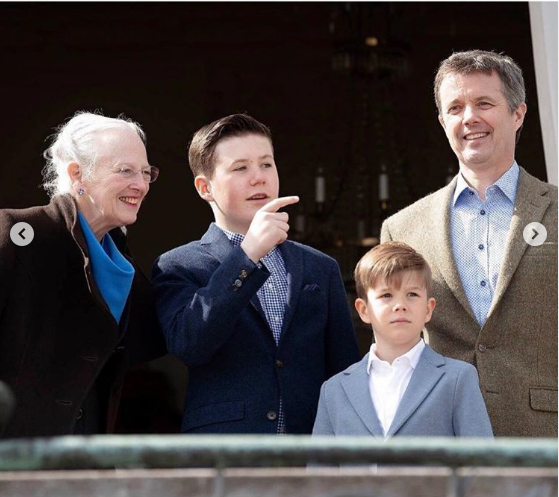 The now 79-year-old was joined by son Prince Frederik, daughter-in-law Princess Mary and their four kids for the occasion at Marselisborg Castle in the city of Aarhus. The beautiful family assembled on the balcony at noon in front of thousands of royal fans, with the Queen taking the lead in the chant. The royal’s voice echoed throughout the grounds as she threw her arm up in the air in enthusiasm. Her moves were copied by eight-year-old Princess Josephine who stood proudly by her father’s side throughout the chant. Mary and Frederik, and their other children Princess Isabella, 11, Prince Vincent, 8 and 13-year-old Prince Christian also showed off their strong voices, smiling and singing along. Once the chant was finished the royal family happily waved to the crowds of people below as a band played the Danish national anthem. At one point the kids left the balcony to collect a bouquet of flowers which Isabella then delivered to her grandmother. Princess Mary looked lovely for the occasion, in a green and white patterned dress which she paired with a cosy green coat. She kept her hair down in soft waves and opted for beautiful pearl, dangly earrings to complete the look. The queen also rugged up for her birthday, with a grey skirt suit, a bright blue blouse and a big wool coat. Her son Frederik chose a smart grey suit for the event which he matched with a blue chequered shirt. The youngest members of the royal family also dressed up for their grandmother’s birthday wearing pretty skirts and smart jackets. Royal fans shared in the birthday celebrations, wishing the queen well and commenting how beautiful it is to see them all together. Are you a fan of the Danish royal family? Do you have a message for Queen Margrethe II for her birthday?